Anti-Human TWIST - Iwai North America Inc.
Click the button below to add the Anti-Human TWIST to your wish list. 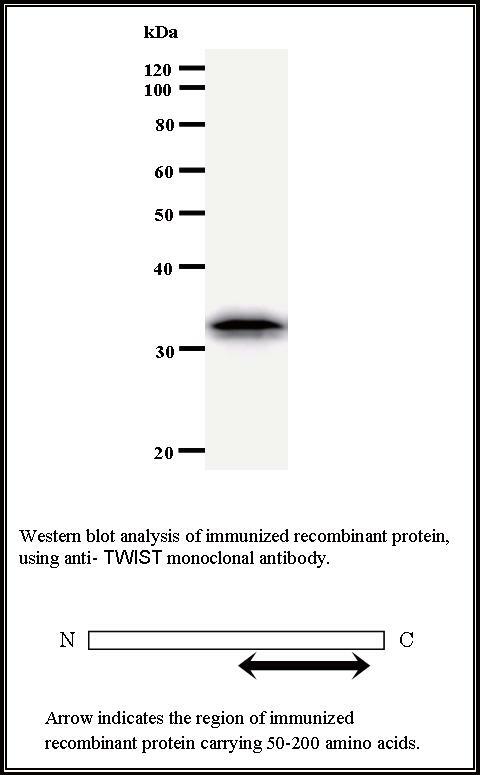 Preparation This antibody was purified using protein G column chromatography from culture supernatant of hybridoma cultured in a medium containing bovine IgG-depleted (approximately 95%) fetal bovine serum. Sterility Filtered through a 0.22 um membrane. Caution must be taken to avoid contact with skin or eyes. In such a case, rinse thoroughly at once with water. Do not ingest, inhale, or swallow. Seek medical attention immediately. Wear appropriate protective clothing such as laboratory overalls, safety glasses and gloves. It is strongly advised that this product should be handled by people who have been well trained in laboratory techniques and that it is handled with care pursuant to the principles of good laboratory practice. All chemicals are deemed potentially harmful. The vial is prone to fall over. Use caution, especially when the lid is off . Manufactured by : Bio Matrix Research, Inc. Questions about this product? Ready to place an order?